The hosts are in third place but they face the team directly below them in the group. This makes the crucial game with respect to qualification for the knock-out round and you can expect both teams to be fired up for this clash. Brazil defeated Spain by one point in their last game, winning 65-66, and Marcelo Huertas offered up 11 points. He may be in the NBA now but Huertas previously played for Barcelona, and you can imagine he enjoyed playing such a key role in defeating the Spanish side. Dario Šarić is also in the NBA, playing with the 76ers and he was the key player for Croatia in their last game, grabbing 19 points in the loss to Argentina. 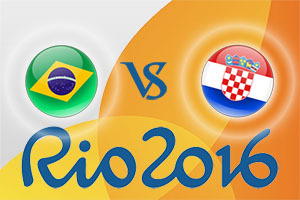 The Croats will need to do better against South American opposition this time around. The hosts are favourites for this one so why not take Brazil at -5, at odds of 1.90. For the Over/Under market, look to go OVER 148.5 which is also on offer at odds of 1.90. Bet Now! In the Race to 20 Points, Brazil can be backed at 1.55. This looks like a game that Brazil may boss from start to finish and if you fancy the idea of a Brazil half-time, Brazil full-time bet, this is available at odds of 1.86. Bet365 is now running player performance bets on selected games and the Brazil v Croatia game is one of them. If you think Croatian star Bojan Bogdanovic will have a big impact on the game, you can back him to grab 19 points or more at odds of 1.71. If you think he’ll offer 18 points or less, have a bet at odds of 2.00. For the hosts, why not look to Leandro Barbosa grabbing over 13.5 points, which you can find at odds of 1.83. Marcelo Huertas is available at odds of 1.95 to go over 8.5 points, so if he replicates his feat of his last outing, this is the bet you want to back. The game starts at 1815 BST on Thursday 11th of August.